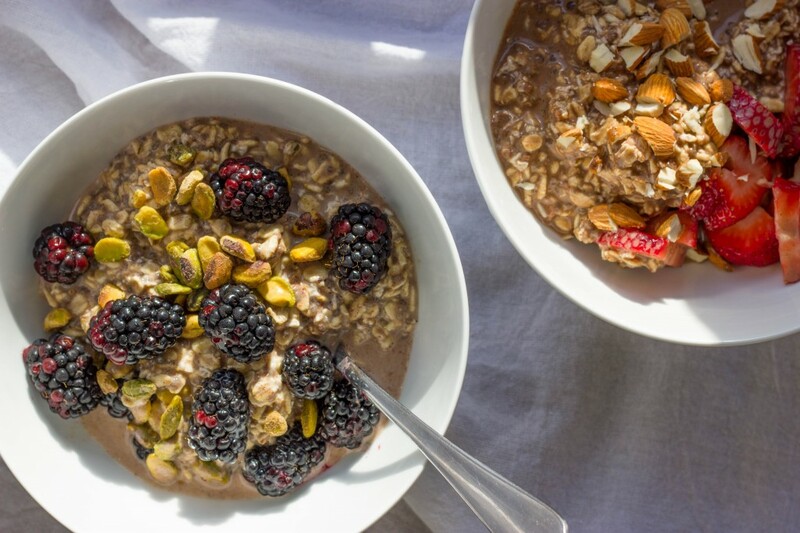 Bircher Oatmeal, or as the Pinterest community has dubbed it, Overnight Oats, is one of the best things you can feed your bod at the start of a busy day. Prepared the night before, it combines the satiating ingredients of fibrous oats, Â chia seeds, milk, and whatever else you wish to add. This recipe is impossible to get bored of (click that link above and pour through the hundreds of shared photos). This is preventative medicine on a few levels – healthy, but preventative in the sense that two minutes the night before saves you from buying the white, sugary pastry the next morning on the hustle to work. We would love to hear what combinations you come up with! Combine all of the ingredients in a jar or bowl, mix well, cover and keep in the fridge overnight. In the morning, you have an instant breakfast.